Gibmiss: Christmas Card Club Lizzies Turn!!!! Gorgeous card, Sylvie! Someone's going to be lucky come Christmas this year! Wow Sylvie, this one is fab, the trees remind me of when we used to take the girls when they were little to pick a real one and then once chosen someone took them out of the ground , netted them and then we took it home to decorate, ahh such a long time ago. where does the time go. Sorry for waffling! Love the card fold. Enjoy your time over here. Ps. would love to join your Christmas club, tried to click on the top but didn't work. Okay - your card is just way too good. I adore it. Now it is very hard for me to imagine you making this card on your lap!! This card is out of this world Merry Christmas good! Wow Sylvie your card is totally gorgeous hun, I love it!!!. Such beautiful colours and loving those tree's. Love the tag you have made too. 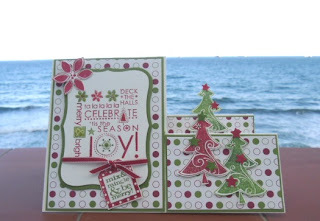 Love the shape you have used Sylvie, and the papers and sentiment are so gorgeous. So beautiful !! Love it !! WOW what a stunning card! Love love love it! I think its the only way I could ever make xmas cards now - I'm just so used to it! Hope you have a super time at the craft fayre and a great visit back here to Blighty! Brilliant stepper card Sylvie! Love the whole design. 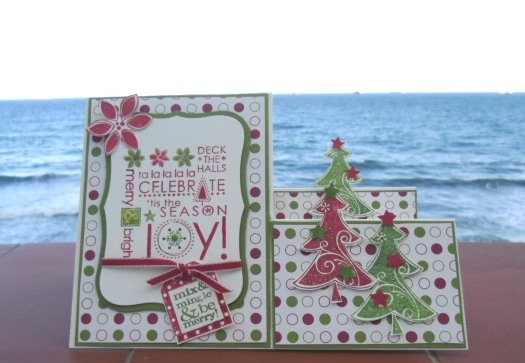 Sylvie, what a lovely Christmas card, just love this SU set...I will join in your christmas challenge but not for a while as we have a very busy month ahead. Loving your Christmas card. Great shape and I love the sentiment arrangement very much. So is your case out and half full now? We have been having a little spell of milder weather . .. .. . I hope it stays this nice for your visit. Hi Sylvie I am a little late but I have finally made it to see this beautiful side stepper card, those trees, colours and design look FAB.